TAO Group, along with real estate developers Richard Heyman and Grant King of Relevant Group, celebrated the highly-anticipated TAO, Beauty & Essex restaurant, Avenue, and Luchini LA Grand Opening with an exclusive invite-only block party. Katie Holmes, Cindy Crawford, Orlando Bloom and Hailey Baldwin were among the Hollywood elite who came out to celebrate TAO Group’s Los Angeles debut. Spotted at Avenue, Cindy Crawford and hubby Randy Gerber enjoyed a fun night out, while DJ Khaled took the stage for a surprise DJ set. Orlando Bloom was also seen at the nightclub with a group of friends, while Draya Michele was seen dancing it up at a table with gal pals. Ashlee Simpson and Evan Ross arrived together looking more in love than ever at Beauty & Essex restaurant. The inseparable couple weren’t afraid to show their affection for one another as Evan was spotted giving her a sweet kiss on the cheek. Jamie Chung, who was sporting an Elizabeth and James bag, was all smiles with husband Bryan Greenberg and were seen enjoying sweets at the Beauty & Essex restaurant dessert bar. Meanwhile at TAO Asian Bistro, Hailey Baldwin dazzled in a sparkly number showing off major leg. Enjoying late night slices of pizza at Luchini, were Michael Bay and Owen Wilson, who both kept a low profile throughout the evening. Eiza Gonzalez was seen rocking a Diesel jacket and Vice Camuto clutch while Adelaide Kane was spotted in a Rachel Zoe dress, Alice + Olivia clutch and Vince Camuto shoes. 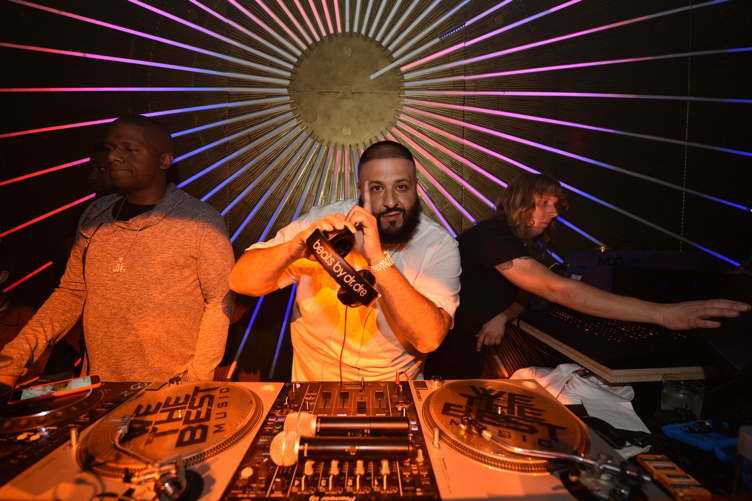 Taking the stage for a surprise special performance were NAS, Busta Rhymes and Anderson Paak while Ross One, DJ Cassidy, Chantel Jeffries, Chris Masterson, and Devin Lucien manned the decks throughout the evening. Tyga made an appearance with pal Scott Disick along with other notable guests including: G-Eazy, Zoe Saldana, Emmanuelle Chriqui, Nicole Scherzinger, and more. Guests enjoyed Poke Wonton Tacos, Petit Imperial Wagyu Sliders and Grilled Cheese, Smoked Bacon & Tomato Soup Dumplings from Chef Chris Santos of Beauty & Essex and Chef Ralph Scamardella of TAO Asian Bistro and imbibed on Tao-Tinis and Emerald Gimlets specialty cocktails. Avenue will officially open its doors on Tuesday, March 21. TAO Asian Bistro, Beauty & Essex and Luchini Pizzeria & Bar will open to the public in early April. Dream Hollywood will open separately and later this spring with a new dining and nightlife concept from TAO Group called The Highlight Room, a rooftop lounge, pool and grill atop of the hotel. TAO Group will exclusively manage all of Dream Hollywood’s food and beverage operations, marking their first West Coast venture.